“The sculpture will provide the audience with the constructed reality and physical sensation of a childlike dreamscape,” said Creston, clinical assistant professor in digital technology and culture and fine arts at Washington State University Tri-Cities. 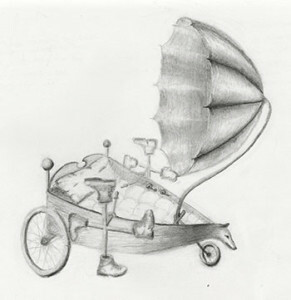 The interactive installation will be a three-wheeled art machine propelled by wind hitting a large umbrella. The vehicle will transition from a bed to ship to bicycle and will be constructed from repurposed materials. Creston uses a combination of new and obsolete technology to construct electronic, kinetic and interactive sculptures and installations. Her work focuses on the impact that materials, movement and interaction have on the viewer’s experience. “As a young artist and educator, Creston brings to the department a high degree of interest with collaborative, interdisciplinary approaches,” said Thom Brown, department chair of fine arts. Artist Trust has invested over $10 million in grants, awards and residencies and career training to thousands of artists since 1987. Learn more about WSU Tri-Cities and its commitment to dynamic student engagement, dynamic research experiences and dynamic community engagement at http://tricity.wsu.edu.